We got home late and I wanted to get dinner going quickly. I was pleased with coming up with a healthy and quick meal plan. I had purchased some frozen organic corn kernels, and was thinking of boiling it with kale, separately preparing limed seitan and maybe even jerk limed seitan, then mixing them together. However, I remembered that I bought a day or two ago a prepared tempeh from Whole Foods Market, and wanted to use it. Though I had wanted to serve the tempeh on its own (as I recall, it had coconut and some interesting seasonings), it worked mixed in to this main course. I hand shredded the lacinato kale leaves into bite-sized chunks, composting the stems and ribs. I had read on the web that vinegar would help in boiling kale, so I got a pot of water plus a few tablespoons of vinegar boiling, then put in the kale, intending to cook till the kale turned dark green - it turned out to be about 10 minutes. A few minutes before I thought I would be done, I added about 2 cups of corn. In the meantime, I was heating the tempeh in my toaster oven. I drained the cook vegetables and mixed in the warmed tempeh. I added a little bit of chopped raw onion, a little soy sauce, maybe 1/8 or 1/4 teaspoon of dried oregano, about 1/8 teaspoon of freshly ground black pepper, and two or three shakes of a liquid smoke seasoning. It turned out to be good! I would like to try similar dishes by boiling maybe kale plus turnips, and mixing in limed seitan. I also made a simple quinoa side dish, and a salad. Organic avocadoes are on sale for ninety-nine cents each at Weaver Street Market! Tonight, I cut 2/3 of a package of tempeh into thin rectangles and sauteed over medium to medium-high heat, adding 1/4 of a medium yellow onion a few minutes into the saute. When the onion was slightly carmelized and tempeh browned (after maybe another 6 minutes or so), I added two small crookneck squashes, sliced into 1/4" pieces, as well as about a teaspoon of grated ginger. I cooked for another 3 minutes or so, then mixed in some dried tarragon and soy sauce. I also made some hashed brown potatoes. I opened up a yummy bottle of macadamia nut butter yesterday, and served it on a seeded lightly toasted pane casserechio. Dinner was good! 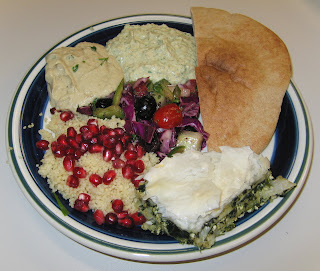 My students made spanakopita, baba ganouj, hummus, Greek Salad, and couscous with pomegranate kernels. 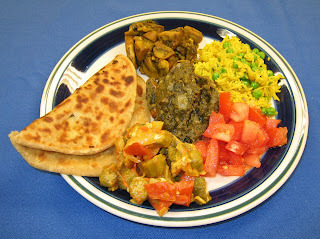 Here is the plate of food that my students put together for tonight's Indian cooking.